Tom Brown, Chef Patron of Cornerstone in Hackney Wick travels to Lichfield! 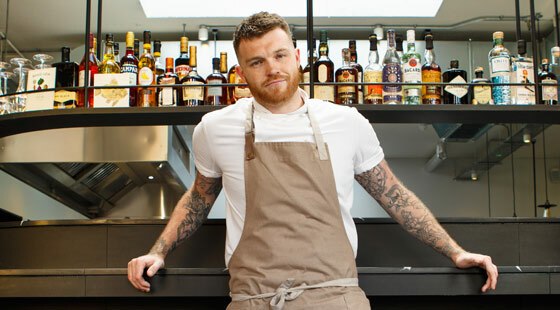 Tom opened his debut restaurant Cornerstone in London’s Hackney Wick on 24 April 2018. Named after his favourite Arctic Monkeys song, the restaurant on Prince Edward Road has been designed by east London-based architect Holland Harvey. The kitchen is at the centre of the restaurant, with a counter bar seating 11. Key features include a 5,000-year-old, 10-seater oak table, salvaged from a river in Croatia, and a lounge area. Cornish distillery the Wrecking Coast has created a bespoke gin for the restaurant’s signature gin and tonic, with citrus tones to pair with seafood. It is distilled with cloudy apple juice from Polgoon Orchard in Cornwall rather than water. Originally from Cornwall, Brown worked for chef Nathan Outlaw for six years, starting at Outlaws at the St Enodoc hotel in Rock, Cornwall, before later moving to the Capital hotel in 2016, where he won a Michelin star. We are honoured to be able to host an evening with Tom and look forward to welcoming him to The Boat Inn. Chef’s Table… is an exciting opportunity for you to enjoy a VIP experience at our pop-up restaurant. Seated just off the pass, you’ll be in amongst the action and receive personal attention from our chefs. Spaces for this are obviously limited for each of our evenings.